A strap charm with cute Shiba Inu, appeared on the Japanese TV BS Friday drama "Kounodori". You can stand it stably as its bottom is flat. It is also recommended to display it as a part of the interior. Dogs have been worshiped as a guardian deity for safe delivery in Japan, as dogs have an easy labor and give birth to many babies at once. Therefore, items with dog motifs have been cherished as a symbol of easy delivery for many years. * This product is hand-painted, so the colour may fade more or less due to a strong impact or friction. * Please note that this product cannot be used for strap holes of some smart phones or some types of bags, because the size of the ring of Netsuke strap is small. Prototype created by: Yumi Nakano (Japanese Female Artist) / A strap charm of cute Shiba Inu, appeared on the Japanese TV BS Friday drama "Kounodori". You can put it in a sitting position as its bottom is flat. It is also recommended to display it as a part of the interior. 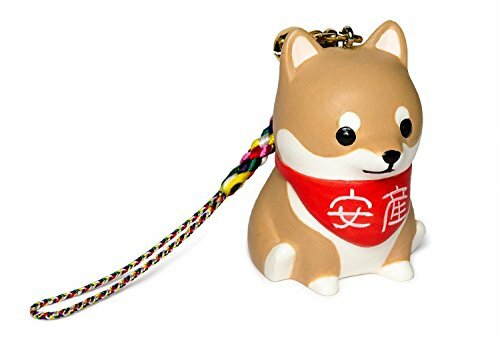 Dogs have been worshiped as a guardian deity for safe delivery in Japan, as dogs are fertile and have an easy labor, therefore, items with dog motifs have been cherished as a symbol of easy delivery. A perfect item for your loved one or a expectant mother who is expecting a baby. If you have any questions about this product by PetLovers, contact us by completing and submitting the form below. If you are looking for a specif part number, please include it with your message.